Thomas Wilkin Cowen was born about 1795 in England and died on 25 Jun 1883 in Port Cygnet, Tasmania aged about 88. 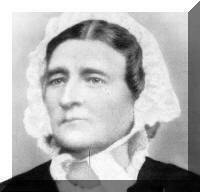 Thomas married convict Mary Blease also known as Mary Walker on 2 Feb 1836 in Hobart, Tasmania. Mary was christened in about 1803 and died on 13 Oct 1885 in Port Cygnet, Tasmania. 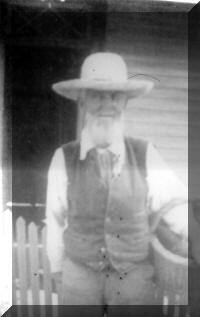 2-Charles Bleeze was born in 1827 and died in 1904 in Hobart, Tasmania at age 77. Charles married Bridget Maddon on 10 May 1855 in Hobart, Tasmania, Bridget was born in 1830 in Ireland and died on 21 Apr 1899 in Hobart, Tasmania, at age 69. Charles Bleeze arrived in Hobart Town with his mother in 1831 and was sent to the Queen's Orphan School from where he was discharged back to his mother in December 1841. He farmed in the Port Cygnet district. Charles and Bridget had four children: John, Charles, Mary Stanislaus and Patrick. 3-John Bleeze was born in 1856. 3-Charles Bleaze was born on 28 May 1857 in Port Cygnet, Tasmania. 3-Mary Stanislaus Bleeze was born in 1858 in Port Cygnet, Tasmania, died on 6 Sep 1931 in Hobart, Tasmania at age 73, and was buried on 8 Sep 1931 in Hobart, Tasmania. Mary married Roderick Fitzpatrick on 26 Jun 1879 in Port Cygnet, Tasmania. Roderick was born in 1844, died on 11 Jun 1924 in Hobart, Tasmania at age 80, and was buried on 12 Jun 1924 in Hobart, Tasmania. They had eight children: Charles, M, Ernest John, Mary Ignatius, Angeline, Annie, Matthew and Eileen. 4-Charles Fitzpatrick was born in 1880 in Franklin, Tasmania., died on 15 Nov 1950 in Hobart, Tasmania at age 70, and was buried on 17 Nov 1950 in Hobart, Tasmania. 4-M Fitzpatrick was born in 1881 in Franklin, Tasmania. and died in 1881 in Franklin, Tasmania. 4-Ernest John Fitzpatrick was born in 1882 in Franklin, Tasmania. 4-Mary Ignatius Fitzpatrick was born in 1884 in Franklin, Tasmania. 4-Angeline Fitzpatrick was born in 1886 in Hobart, Tasmania. 4-Annie Fitzpatrick was born in 1888 in Franklin, Tasmania. and was buried on 22 Oct 1965 in Hobart, Tasmania. 4-Matthew Fitzpatrick was born in 1890 in Franklin, Tasmania. 4-Eileen Fitzpatrick was born in 1894 in Hobart, Tasmania. 3-Patrick Bleeze was born on 29 Mar 1861 in Port Cygnet, Tasmania, died on 23 Jun 1945 in Hobart, Tasmania at age 84, and was buried on 26 Jun 1945 in Hobart, Tasmania. 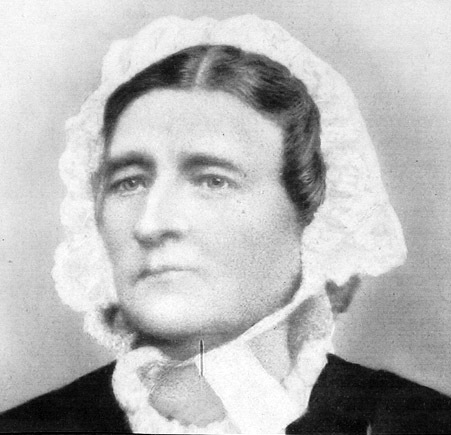 2-Mary Ann Cowen was born on 29 Sep 1834 in Hobart, Tasmania and died on 21 Jun 1927 in Hobart, Tasmania at age 92. Mary married convict James Bones, son of William Bones and Mary Draper, on 16 Jan 1852 in St Peters Church, Bruny Island, Tasmania. 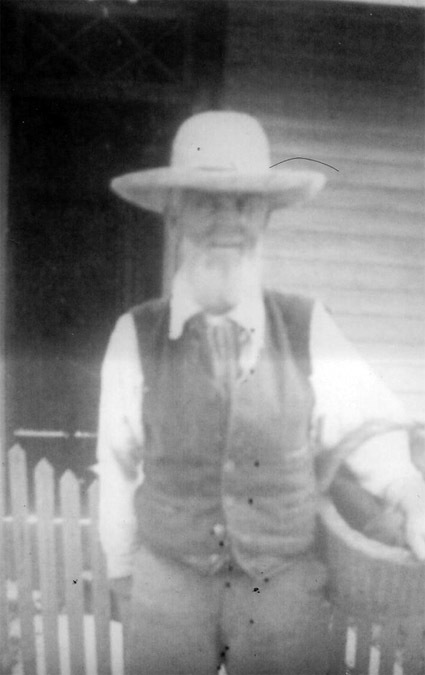 James was born in 1821 in Wormshill, Kent, England and died on 31 Jul 1899 in Gordon, Tasmania, Australia. at age 78. He was convicted at the Kent Assizes on 11 March 1844 and sentenced to seven years' transportation for stealing three sacks of oats value £2 from Mr. Benstead at Wormsley. He had a previous sentence of 11 months for desertion from the 88th Regiment. They had 12 children: James, William, Thomas, Henry, Richard, Mary Ann, Henry, Amy, Benjamin, Sarah Ann, Eliza and Edward Robert. 3-James Bones was born in 1851. James married Sarah Jane Lancaster on 24 Feb 1875 in Hobart, Tasmania. Sarah was born about 1853. They had eight children: Adaline, James, Charles, William, Henry, Harriet, Bertie Edwin and Walter. 4-Adaline Bones was born on 11 Mar 1877 in Port Cygnet, Tasmania. Another name for Adaline was Adelaide. Adaline married Richard Brittain on 16 Dec 1896 in Port Cygnet, Tasmania. Richard was born about 1874. They had one son: Leslie George. 5-Leslie George Brittain was born on 28 Dec 1907 in Garden Island Creek, Port Cygnet, Tasmania. Leslie married his second cousin Azel Pretoria Brittain, daughter of George Herbert Brittain and Mary Ann Bones, on 22 Oct 1927 in St Marks Church, Cygnet, Tasmania. Azel was born on 10 Feb 1907 in Garden Island Creek, Port Cygnet, Tasmania. 4-James Bones was born on 23 Dec 1878 in Port Cygnet, Tasmania. 4-Charles Bones was born on 21 Nov 1880 in Port Cygnet, Tasmania. 4-William Bones was born on 29 Aug 1881 in Gordon, Tasmania and died on 4 Oct 1955 in Battery Point, Tasmania at age 74. William married Ethel May Thomas, daughter of Hannah Thomas, on 24 Dec 1907 in Hardcastle, Arthur Street, West Hobart, Tasmania. Ethel was born on 2 May 1891 in Hobart, Tasmania. They had five children: Ethel Hannah, Ruby Sarah, Vera May, Corrie and Donald William. 5-Ethel Hannah Bones was born on 3 Oct 1908 in Gordon, Tasmania and died about 2004 in Hamilton, Tasmania aged about 96. Ethel married Walter William Sonners, son of Albert Sonners and Esther Elizabeth Webberley, on 10 Apr 1929 in Holy Trinity Church, Hobart, Tasmania. Walter was born on 7 Aug 1898 in Hamilton, Tasmania and died about 1983 in Hamilton, Tasmania aged about 85. 5-Ruby Sarah Bones was born on 23 Jul 1910 in Gordon, Tasmania. Ruby married Leslie Frederick Salter, son of William George Salter and Sarah Jane Hunt, on 12 Jul 1927 in Registrar Generals Office, Hobart. Leslie was born on 29 Dec 1907 in Glenora, Tasmania. 5-Vera May Bones was born on 13 Nov 1912 in Dover, Tasmania and died about 1978 aged about 66. Vera married Louis Arnold Edward Shea, son of William Shea and Margaret Keir, on 8 May 1925 in St John the Baptist Church, Hobart, Tasmania. Louis was born on 15 Jun 1906 in Scottsdale, Tasmania and died on 6 Apr 1990 at age 83. 5-Corrie Bones was born on 18 Sep 1914 in Garden Island Creek, Port Cygnet, Tasmania. 5-Donald William Bones was born on 18 Jun 1916 in Garden Island Creek, Port Cygnet, Tasmania, died on 12 Sep 1994 in Warrane, Tasmania at age 78, and was buried in Cornelian Bay, Tasmania. 4-Henry Bones was born on 3 Jan 1886 in Port Cygnet, Tasmania, died on 24 Feb 1960 in 96 Howard Road, Goodwood, Tasmania at age 74, and was buried on 26 Feb 1960 in Cygnet, Tasmania. Henry married Selina Isabel Crisp, daughter of Samuel Crisp and Ann Woodley, on 13 May 1907 in Hobart, Tasmania. Selina was born on 6 Apr 1887 in Bruny Island, Tasmania and died in Sep 1968 at age 81. They had four children: Eileen Daisy, Bingham Henry, William Charles and Marjorie Jean. 5-Eileen Daisy Bones was born on 17 Aug 1907 in Lovett, Cygnet, Tasmania. Eileen married John Herlihy on 3 Mar 1922 in Home of the Bride, Gardners Bay, Tasmania. 5-Bingham Henry Bones was born on 16 May 1910 in Gardners Bay, Tasmania. 5-William Charles Bones was born on 25 Mar 1912 in Bothwell, Tasmania. 5-Marjorie Jean Bones was born on 27 Apr 1914 in Waddamana, Tasmania. 4-Harriet Bones was born on 23 Mar 1888 in Gordon, Tasmania. 4-Bertie Edwin Bones was born on 29 Sep 1893 in Port Cygnet, Tasmania. 4-Walter Bones was born on 14 Apr 1897 in Port Cygnet, Tasmania. 3-William Bones was born on 29 Mar 1853 in Hobart, Tasmania. William married Emily Mills on 20 Nov 1879 in Port Cygnet, Tasmania. Emily was born about 1859 and died on 25 Nov 1891 in Port Cygnet, Tasmania aged about 32. They had seven children: Emily, Edith, Caroline, Mary Ann, Ada, Ethel and Amy. 4-Emily Bones was born on 3 Apr 1881 in Port Cygnet, Tasmania. Emily married Henry Cowen, son of Richard Cowen and Emma Chalis Linton Chalis, on 5 Dec 1899 in Port Cygnet, Tasmania. 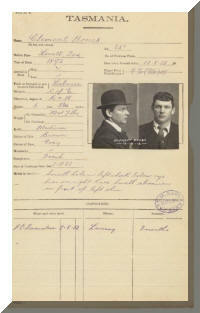 Henry was born on 29 Sep 1875 in Port Cygnet, Tasmania. He served in the First World War. 4-Edith Bones was born on 21 Jan 1883 in Port Cygnet, Tasmania. 4-Caroline Bones was born on 27 Dec 1884 in Port Cygnet, Tasmania and died on 27 Dec 1904 in Port Cygnet, Tasmania at age 20. 4-Mary Ann Bones was born on 15 Sep 1886 in Port Cygnet, Tasmania and died on 20 Feb 1887 in Port Cygnet, Tasmania. Mary married George Herbert Brittain, son of James Brittain and Sarah Simmons, on 17 Jul 1901 in Garden Island Creek, Port Cygnet, Tasmania. George was born on 16 Mar 1877 in Port Cygnet, Tasmania. They had seven children: Clara May, Dorothy Sarah Victoria, George Henry, Azel Pretoria, Edward James, James William and Gerald Leige. 5-Clara May Brittain was born on 22 Jul 1901 in Garden Island Creek, Port Cygnet, Tasmania and died on 10 Nov 1983 at age 82. Clara married Richard Philip Millhouse, son of Sydney Herbert Millhouse and Eliza Jane Beltz, on 19 Jun 1926 in Cygnet, Tasmania. Richard was born on 23 Oct 1906 in Garden Island Creek, Port Cygnet, Tasmania and died about 1963 aged about 57. 5-Dorothy Sarah Victoria Brittain was born on 24 Jan 1903 in Garden Island Creek, Port Cygnet, Tasmania. Dorothy married Edward John Fielding, son of John Fielding and Mary Ann Shreeve, on 20 Apr 1922 in Garden Island Creek, Port Cygnet, Tasmania. Edward was born on 25 May 1902 in Adventure Bay, Bruny Island. Tasmania. 5-George Henry Brittain was born on 18 Oct 1904 in Stanmore, Port Esperance, Tasmania. George married Lily May Bergmann, daughter of Henry George Bergmann and Priscilla may Watson, on 8 Sep 1928 in Gordon, Tasmania. Lily was born on 25 Jan 1906 in Gordon, Tasmania. 5-Azel Pretoria Brittain was born on 10 Feb 1907 in Garden Island Creek, Port Cygnet, Tasmania. 5-Edward James Brittain was born on 14 Jul 1909 in Garden Island Creek, Port Cygnet, Tasmania. 5-James William Brittain was born on 23 Nov 1911 in Dover, Tasmania. 5-Gerald Leige Brittain was born on 6 Sep 1914 in Garden Island Creek, Port Cygnet, Tasmania. 4-Ada Bones was born on 8 Jan 1888 in Gordon, Tasmania. 4-Ethel Bones was born on 24 Aug 1890 in Gordon, Tasmania. Ethel married Walter William Sonners no Denny on 10 Apr 1929 in Holy Trinity Church of England, Hobart. 4-Amy Bones was born on 17 Nov 1891 in Port Cygnet, Tasmania and died on 25 Nov 1891 in Port Cygnet, Tasmania. William next married Elizabeth Dooling on 2 Nov 1898 in Port Cygnet, Tasmania. Elizabeth was born about 1859. 3-Thomas Bones was born in 1856 in Kinstead, Kent, England and died in 1932 at age 76. Thomas married Charlotte Elizabeth Sculthorp on 28 Oct 1880 in Port Cygnet, Tasmania. Charlotte was born about 1858. They had nine children: Joseph, Osbourne, Maurice Benjamin Charles, Violet Gertrude, Walter, Anthony, Harold E. Sculthorpe, Rose and Olive. 4-Joseph Bones was born on 22 Sep 1881 in Port Cygnet, Tasmania. 4-Osbourne Bones was born on 26 Apr 1887 in Port Cygnet, Tasmania. 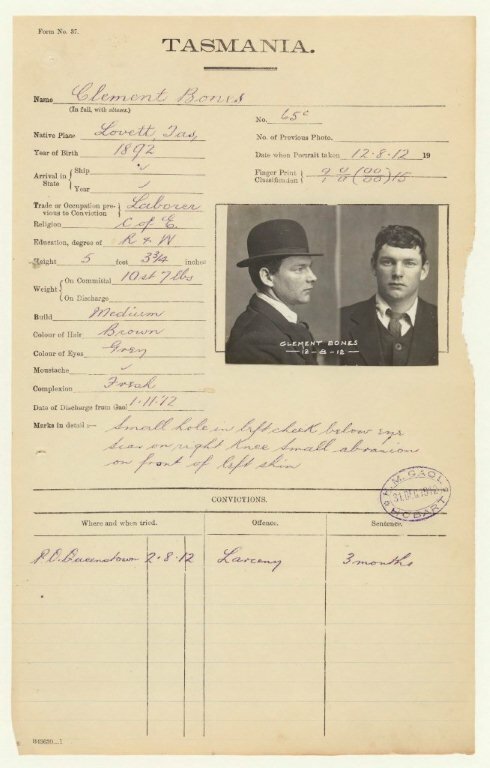 4-Maurice Benjamin Charles Bones was born on 18 Sep 1889 in Port Cygnet, Tasmania. 4-Violet Gertrude Bones was born on 28 Dec 1892 in Port Cygnet, Tasmania. 4-Walter Bones was born on 28 Dec 1892 in Port Cygnet, Tasmania. 4-Anthony Bones was born on 30 Oct 1895 in Port Cygnet, Tasmania. 4-Harold E. Sculthorpe Bones was born in 1898 and died on 26 Oct 1898 in Port Cygnet, Tasmania. 4-Olive Bones was born on 7 Mar 1901 in Irish Town, Port Cygnet, Tasmania. 3-Henry Bones was born on 21 Nov 1857 in Gordon, Tasmania and died about 1860 aged about 3. 3-Richard Bones was born on 16 Dec 1859 in Port Cygnet, Tasmania and died on 2 Feb 1904 in Zeehan, Tasmania at age 44. Richard married Elizabeth Mary Ann Lockley, daughter of Robert Lockley and Catherine Ainsley, on 24 Dec 1881 in St Marks Church, Port Cygnet, Tasmania. Elizabeth was born on 24 Jul 1861 in Gordon, Tasmania. They had 12 children: Denis Henry, Virtue, Victor, Edgar Richard, Patience Victoria, Lucy, Lewis, Clement Oscar, Lance Douglas Percy, Olive Maude, Grace Angela and Thelma Eunice Clarissa. 4-Denis Henry Bones was born on 9 May 1883 in Port Cygnet, Tasmania. Denis married Elizabeth Cowen. They had four children: Eveline Bertha, Greta Beatrice, Lorance Mervyn and Reginald Richard. 5-Eveline Bertha Bones was born on 26 Dec 1911 in Lovett, Cygnet, Tasmania. 5-Greta Beatrice Bones was born on 19 Dec 1914 in Gardners Bay, Tasmania. 5-Lorance Mervyn Bones was born on 24 Sep 1916 in Gardners Bay, Tasmania. 5-Reginald Richard Bones was born on 25 Dec 1918 in Gardners Bay, Tasmania. 4-Virtue Bones was born on 2 Aug 1884 in Port Cygnet, Tasmania. Virtue married David Blegg on 27 Nov 1906 in Hobart, Tasmania. 4-Victor Bones was born on 6 Dec 1885 in Port Cygnet, Tasmania and died on 4 Feb 1969 at age 83. Victor married Maria Jane Coulson, daughter of George Coulson and Adelaide Lancaster, on 13 Jan 1908 in Lovett, Cygnet, Tasmania. Maria was born on 11 Dec 1889 in Gordon, Tasmania and died on 21 Dec 1928 in Homeopathic Hospital, Hobart at age 39. They had three children: Eric, Dorothy Jean and Tassie George. 5-Eric Bones was born on 4 Jul 1908 in Lovett, Cygnet, Tasmania. 5-Dorothy Jean Bones was born on 17 Feb 1911 in Hastings, Tasmania. 5-Tassie George Bones was born on 15 Jul 1914 in Strathblane, Tasmania. 4-Edgar Richard Bones was born on 23 Feb 1887 in Port Cygnet, Tasmania. Edgar married Phylotta May Green on 10 Feb 1908 in Hobart, Tasmania. They had two children: Unice Kathleen Beatrice and Esmerelda Mary. 5-Unice Kathleen Beatrice Bones was born on 18 Dec 1908 in Gardners Bay, Tasmania. 5-Esmerelda Mary Bones was born on 13 Mar 1910 in Gardners Bay, Tasmania. 4-Patience Victoria Bones was born on 16 Apr 1888 in Port Cygnet, Tasmania. Patience married Edward Dillon, son of John Dillon and Mary. Edward was born on 18 Nov 1878 in Port Cygnet, Tasmania. 4-Lucy Bones was born on 11 Oct 1889 in Port Cygnet, Tasmania. Lucy married Thomas John Gorman on 23 Aug 1913 in Hobart, Tasmania. 4-Lewis Bones was born on 11 Dec 1890 in Port Cygnet, Tasmania. Lewis married May Isabel Hill on 17 Aug 1920 in Registrar Generals Office, Hobart. 4-Clement Oscar Bones was born on 15 Dec 1892 in Port Cygnet, Tasmania. He served in the First World War. Clement married Gertrude Pregnell on 1 Jun 1917 in Hobart, Tasmania. 4-Lance Douglas Percy Bones was born on 23 Jul 1894 in Port Cygnet, Tasmania. 4-Olive Maude Bones was born on 26 Aug 1896 in Port Cygnet, Tasmania. Olive married Hilary Joseph Gorman on 31 Jul 1915 in St Peters Church, Geeveston, Tasmania. 4-Grace Angela Bones was born on 1 Oct 1899 in Port Cygnet, Tasmania. Grace married Walter Tasman Cowen, son of Richard Cowen and Emma Chalis Linton Chalis, on 18 Aug 1920 in Registrar Generals Office, Hobart. Walter was born on 14 Feb 1895 in Port Cygnet, Tasmania. 4-Thelma Eunice Clarissa Bones was born on 2 Mar 1901 in Port Cygnet, Tasmania. Thelma married Edward Gordon on 1 Mar 1923 in Registrar Generals Office, Hobart. 3-Mary Ann Bones was born on 24 Oct 1862 in Port Cygnet, Tasmania. Mary married Sarsfield Alexander Benbow, son of Searsfield Benbow and Annie McDowell, on 23 Oct 1889 in Hobart, Tasmania. Sarsfield was born on 13 Dec 1869 in Hobart, Tasmania. They had five children: Ernest Charles, Rosie may, Ethel Maude, Horace Sarsfield and Myrtle Mary. 4-Ernest Charles Benbow was born on 5 Sep 1890 in Hobart, Tasmania. 4-Rosie may Benbow was born on 4 Mar 1892 in Hobart, Tasmania. 4-Ethel Maude Benbow was born on 17 Nov 1893 in Port Cygnet, Tasmania. 4-Horace Sarsfield Benbow was born on 1 Jan 1896 in Gordon, Tasmania. 4-Myrtle Mary Benbow was born on 13 Sep 1898 in Gordon, Tasmania. 3-Henry Bones was born on 26 May 1865 in Port Cygnet, Tasmania and died in 1940 at age 75. Henry married Elizabeth Ann Brittain on 4 Jun 1888 in Port Cygnet, Tasmania. Elizabeth was born about 1868. Henry next married Alice Elizabeth Josephine Grosse on 5 Dec 1911 in Woodbrige, Tasmania. They had two children: Milford Tasman Henry and Linda May. 4-Milford Tasman Henry Bones was born on 20 Mar 1913 in 224 Melville Street, West Hobart, Tasmania. 4-Linda May Bones was born on 20 Oct 1918 in Gordon, Tasmania. 3-Amy Bones was born on 13 Oct 1867 in Port Cygnet, Tasmania. Amy married Henry Smith on 19 Aug 1890 in Hobart, Tasmania. Henry was born about 1862. 3-Benjamin Bones was born on 5 Apr 1870 in Port Cygnet, Tasmania and died in 1954 at age 84. Benjamin married Rachel Pearsall on 20 Jun 1894 in Port Cygnet, Tasmania. Rachel was born about 1868. 3-Sarah Ann Bones was born on 26 Aug 1872 in Port Cygnet, Tasmania and died in 1950 at age 78. Sarah married John Thomas Lovell, son of William Lovell and Isabel Walford, on 23 May 1899 in Hobart, Tasmania. John was born about 1877 in Franklin, Tasmania. 3-Eliza Bones was born on 9 Aug 1875 in Port Cygnet, Tasmania. Eliza married Thomas William Turnbull, son of Frederick Henry Turnbull and Georgina Jones, on 23 Dec 1897 in Gordon, Tasmania. Thomas was born on 15 Feb 1877 in Kingston, Tasmania and died on 12 Aug 1940 in Cygnet, Tasmania at age 63. They had 11 children: Lily Martha, Amy Rosetta, Charlotta Jane, Thomas Edwin, James Henry, Valentine Charles, Benjamin John, Rosie May, Victoria, Maxwell Mervyn and Not Recorded. Their story is told here. 3-Edward Robert Bones was born on 27 Jun 1879 in Port Cygnet, Tasmania and died on 18 Jul 1969 in Dover, Tasmania at age 90. Another name for Edward was Edwin Robert Bones. Edward married Lucy Isabel May Berry, daughter of John Berry and Elizabeth Timbs, on 4 Dec 1911 in Birchs Bay, Tasmania. Lucy was born on 31 May 1885 in Kingston, Tasmania. They had five children: Edith Royal May, Richard Edwin James, Priscilla Glorine Elizabeth, Edwin Benjamin Donald and William Robert Henry. 4-Edith Royal May Bones was born on 2 Sep 1912 in Garden Island Creek, Port Cygnet, Tasmania. 4-Richard Edwin James Bones was born on 19 Feb 1914 in Birchs Bay, Tasmania. 4-Priscilla Glorine Elizabeth Bones was born on 5 Jul 1915 in Middleton, Tasmania. 4-Edwin Benjamin Donald Bones was born on 7 Mar 1917 in Middleton, Tasmania. 4-William Robert Henry Bones was born on 15 Dec 1918 in Gordon, Tasmania. 2-Thomas George Cowen was born in 1837 in Hobart, Tasmania. Thomas married Ellen Wilson on 7 Nov 1874 in Franklin, Tasmania. Ellen was born in 1850 in Hobart, Tasmania. They had five children: Thomas George, John Herbert, F, Charles Robert and Frederick William. 3-Thomas George Cowen was born in 1875. 3-John Herbert Cowen was born in 1877. 3-F Cowen was born in 1878 and died in 1878. 3-Charles Robert Cowen was born in 1881. 3-Frederick William Cowen was born in 1883. 2-Joseph Cowen was born in 1839 in Hobart, Tasmania. Joseph married Harriet Devereux in 1866 in Port Cygnet, Tasmania. Harriet was born in 1850. They had 11 children: Matilda, Sarah Maria, Eliza Jane, M, Joseph, Alfred, Harriet Elizabeth, Hannah Rubina, Sydney Albert, Mary Edith and Basil Tasman. 3-Matilda Cowen was born in 1865. 3-Sarah Maria Cowen was born in 1867. 3-Eliza Jane Cowen was born in 1869. 3-M Cowen was born in 1871 and died in 1871. 3-Joseph Cowen was born in 1872. 3-Alfred Cowen was born in 1874. 3-Harriet Elizabeth Cowen was born in 1876. 3-Hannah Rubina Cowen was born in 1878. 3-Sydney Albert Cowen was born in 1883. 3-Mary Edith Cowen was born in 1885. 3-Basil Tasman Cowen was born in 1892. 2-Richard Cowen was born in 1842 in Hobart, Tasmania. Richard married Emma Chalis Linton Chalis, daughter of William Chalis and Sarah Linton, in 1872 in Franklin, Tasmania. Emma was born on 6 Apr 1854 in Port Cygnet, Tasmania. They had ten children: Richard, Henry, Elizabeth, William Edward, Charles Watson, Emma, Thomas, Albert John, Walter Tasman and Joseph. 3-Richard Cowen was born on 14 Sep 1873 in Port Cygnet, Tasmania. 3-Henry Cowen was born on 29 Sep 1875 in Port Cygnet, Tasmania. He served in the First World War. 3-Elizabeth Cowen was born on 2 Jun 1878 in Port Cygnet, Tasmania. 3-William Edward Cowen was born on 23 Nov 1880 in Port Cygnet, Tasmania. 3-Charles Watson Cowen was born on 30 Aug 1883 in Port Cygnet, Tasmania, died in the First World War on 23 Jul 1917 in Kandahar Farm, Belgium at age 33, and was buried in Kandahar Farm Cemetery (Plot II, Row C, Grave No. 5), Neuve-Eglise, Belgium. Charles married Brittania Pregnell. 3-Emma Cowen was born in 1886. 3-Thomas Cowen was born on 5 Jan 1889 in Port Cygnet, Tasmania. He served in the First World War. 3-Albert John Cowen was born in 1891. 3-Walter Tasman Cowen was born on 14 Feb 1895 in Port Cygnet, Tasmania. 3-Joseph Cowen was born on 2 Dec 1897 in Port Cygnet, Tasmania. 2-Sarah Cowen was born in 1844. Sarah married Thomas Nichols in 1870 in Port Cygnet, Tasmania. Thomas was born in 1835. They had seven children: Thomas Henry, Annie, Elizabeth, Susan Geraldine, Hilda Sarah, Mary and John. 3-Thomas Henry Nichols was born in 1872 in Port Cygnet, Tasmania. Thomas married Susan Isabell Stanton in 1897 in Port Cygnet, Tasmania. Susan was born in 1870 in Cygnet, Tasmania. They had one son: Eric Thomas Stanley. 4-Eric Thomas Stanley Nichols was born in 1898 in Port Cygnet, Tasmania and died in 1898 in Port Cygnet, Tasmania. 3-Annie Nichols was born in 1873 in Port Cygnet, Tasmania. Annie married John William Stanton in 1896 in Port Cygnet, Tasmania. John was born in 1872 in Port Cygnet, Tasmania. They had one son: John Thomas. 4-John Thomas Stanton was born in 1897 in Port Cygnet, Tasmania. 3-Elizabeth Nichols was born in 1875 in Port Cygnet, Tasmania. 3-Susan Geraldine Nichols was born in 1877 in Port Cygnet, Tasmania, died on 17 Jul 1956 in Hobart, Tasmania at age 79, and was buried on 18 Jul 1956 in Hobart, Tasmania. Susan married Robert Thorp. Robert was buried in Cygnet, Tasmania. They had four children: Pearl Beatrice, Keith Allen, Cyril Bertram and John Stanley. 4-Pearl Beatrice Thorp was born in 1899 in Port Cygnet, Tasmania, died on 7 Sep 1977 in Moonah, Tasmania, Australia. at age 78, and was buried on 9 Sep 1977 in Hobart, Tasmania. Pearl married Clarence Rhyceowen Langridge. Clarence was born in 1893, died on 20 Jun 1958 in Hobart, Tasmania at age 65, and was buried on 23 Jun 1958 in Hobart, Tasmania. They had two children: Dorothy Pearl and Geraldine Clarice. 5-Dorothy Pearl Langridge was born on 31 Oct 1920 in Hobart, Tasmania. Dorothy married Henry Charles Clarence Hepburn, son of Henry George Hepburn and Annie Isabel Broadley. Henry was born on 10 Oct 1913 in New Town, Hobart, Tasmania, died on 4 Dec 2003 in Hobart, Tasmania at age 90, and was buried on 7 Dec 2003 in Orford, Tasmania. They had one daughter: Ann Beatrice. 6-Ann Beatrice Hepburn was born on 2 Jan 1961 in Hobart, Tasmania. Ann married Geoffrey Isaac French. Geoffrey was born on 16 Jul 1936 in Melbourne, Victoria. They had two children: Michael Geoffrey Charles and Peter Allen Edward. 7-Michael Geoffrey Charles French was born on 2 May 1991 in Melbourne, Victoria. 7-Peter Allen Edward French was born on 8 Sep 1992 in Melbourne, Victoria. 5-Geraldine Clarice Langridge was born on 17 Feb 1922 in Hobart, Tasmania, died on 6 Jun 1998 in Hobart, Tasmania at age 76, and was buried in Kingston, Tasmania, Australia. 3-Hilda Sarah Nichols was born in 1879 in Port Cygnet, Tasmania, died on 16 Apr 1955 in Hobart, Tasmania at age 76, and was buried on 18 Apr 1955 in Hobart, Tasmania. 3-Mary Nichols was born in 1882 in Port Cygnet, Tasmania and died in 1884 in Port Cygnet, Tasmania at age 2. 3-John Nichols was born in 1885 in Port Cygnet, Tasmania. 2-Matilda Ann Cowen was born in 1847 in Hobart, Tasmania. Matilda married William Smith in 1871 in Franklin, Tasmania. William was born in 1846. They had nine children: William Thomas, Alfred Henry, Ada Matilda, Eva Florence, James, Robert Francis, Frederick Walter, Amy Amelia and Emily Mary. 3-William Thomas Smith was born in 1872. 3-Alfred Henry Smith was born in 1874. 3-Ada Matilda Smith was born in 1876. 3-Eva Florence Smith was born in 1877. 3-James Smith was born in 1879. 3-Robert Francis Smith was born in 1881. 3-Frederick Walter Smith was born in 1883. 3-Amy Amelia Smith was born in 1885. 3-Emily Mary Smith was born in 1886. 2-Henry Cowen was born in 1849 in Hobart, Tasmania. Henry married Ann Coy in 1873 in Franklin, Tasmania. Ann was born in 1854 in Hobart, Tasmania. They had nine children: Henry James, Mary Ann, William Charles, Joseph Edward, George, Amy Ann, Herbert John, George Watkin Llewel and Susan Elizabeth. 3-Henry James Cowen was born in 1874. 3-Mary Ann Cowen was born in 1876. 3-William Charles Cowen was born in 1879. 3-Joseph Edward Cowen was born in 1881. 3-George Cowen was born in 1883. 3-Amy Ann Cowen was born in 1885. 3-Herbert John Cowen was born in 1888. 3-George Watkin Llewel Cowen was born in 1890. 3-Susan Elizabeth Cowen was born in 1895.